I recently purchase a 93 GTi with low kms (170 thou) to use as a fun cheap work bus. I work down the west coast of Tas so I've got a 30 minute drive through high speed windy roads every day and after my previous runabout died (a very very cheap swift sedan that I had great fun in) I though bugger it why not get a GTi. Well all was good for about two weeks when one day I'm on my way to work at 5 to 5 in the morning only about a km from home thankfully when all of a sudden I've got no drive. Was just idling along in fifth so thought it might have blown fifth, change to fourth nothing work back through the gears. They're quite obviously engaging but nothing doing. s**t, done a diff. Jump on here and read everything in technical, search everything and apparently I've probably done spider gears. Oh well. Get the car home and start pulling the gearbox out using FangGTis helpful post in the tech sticky. Jack up and drop the oil to start with, that does not look good. appears to be half metal half 90 weight. I sense a new gearbox in my immediate future. Keep disconnecting and removing bits. About halfway through I go to remove the passenger side driveshaft, it's already out and just sitting there. Pull it out all the way to have a better look. Grab hold of the DS shaft and turn it and can see spline turning in box where driveshaft should be, apparently it's not as destroyed as all that metal led me to believe. Well the driveshaft falling out is obviously my problem but my question is how? I don't know a hell of a lot about front wheel drives but thought they were more or less held in by their length? Is there a pin or bearing that holds it in that's destroyed itself somehow? Am I fine to pull the box apart and clean it and put it back together or should I replace the driveshafts even though they look fine? They actually look like they've been done fairly recently, fresh boots and still new looking. It may just be because it's been boy racered and not looked after as well as it should be, there's some terrible wiring been done to it which I planned on fixing this weekend before this happened, but it's also obviously had cams done at some stage with how it idles and it has a Suzitech strut brace as well as what looks like adjustable Konis and lowered King Springs. It also had some bell housing bolts missing which worries me a little as well as not having an inspection plate over the flywheel. How do I tell if it's actually a GTi box or if it's just a cino box someone's already swapped in? I did see a post on this by (I think?) DMWDave but cannot for the life of me find it now. In the interim I'm going to put box out of the sedan into it to get me to work next week (I work Thursday to Wednesday and then have week off so it's not super urgent) but the driveshaft falling out worries me, am I right to use it or should I swap that too or just buy new ones or will I be better off getting a 1600 box (wrecker just down the road has one and I could have everything for $400 odd) or one of the rebuilt boxes with an LSD in the for sale section? I don't mind spending a bit so long as I get something reliable that will take a little bit of a flogging every now and then but isn't going to get thrashed all day every day and is still suitable for a daily as that's what it essentially will be. Sorry for the war and peace post but I've been lurking in here for a fortnight reading the faqs and stickies and haven't found anything exactly like my problem. Are you sure you haven't snapped a CV joint? Not an uncommon problem if the car has had a hard life. There should be a circular snap ring that holds the inner driveshaft onto the spline in the box. If it’s in good condition and the spline is not rusty it should take a good firm push to snap it in place and a sometimes fair bit harder tug to get off. 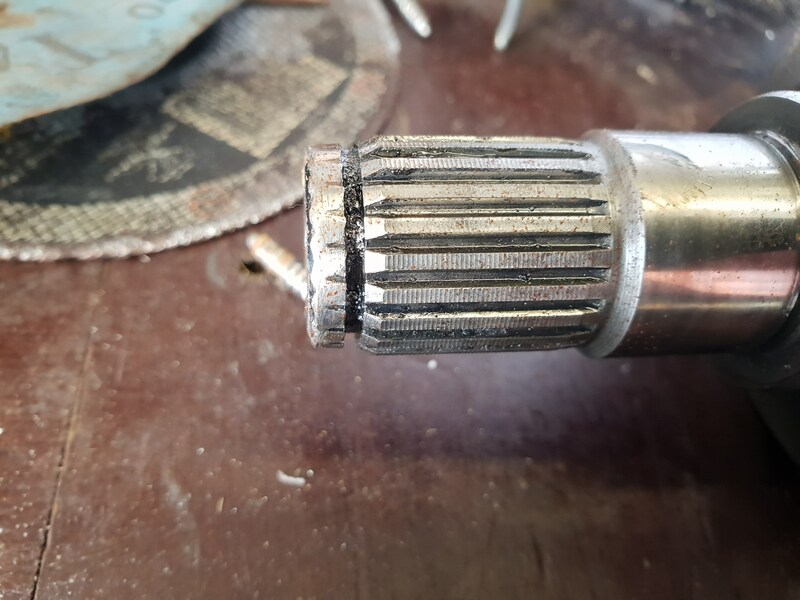 I am guessing whoever replaced those driveshafts last time reused the old snap rings making it not seat properly and if your lucky the metal fragments are only the ring which got crunched up or the end of the spline which copped the wear as it fell off. Good idea to really flush out box and buy new snap rings for both sides. I reused a snap ring once and it totally locked itself onto the spline. It was out of shape from taking it off so i bent it back into shape. What a effort to separate, never again will i reuse them, always new from now on. As for if it’s a real gti box there is a extra mounting hole on the bell housing towards the front of car for a cast iron bracket bolted to the block, but the internals could be from anything. That's almost certainly it then. Went and had a look at the waste oil and once it had settled there's about as much as a large circlips worth. Will pull it apart and clean it out. Yeah CV is fine, looks new in fact apart from right at the end where it's obviously been spinning against the spline. What i have done in the past is use real cheap gear oil to get anything lying around in there and go for a small drive. Dump it onto a screen thats collecting the old oil. Check it for bits and reuse oil and repeat a few times. When happy with the clean put good oil in and replace again after a few months. At the time i needed to use it and had no back up. Probably a good idea to do the seals while your at it. Have pulled the box out of my G13BA sedan to compare. One out of the GTi has the extra bolt holes so suspect it's a GTi box. Can take my ute to work this week if I need to so may just order seals and bearings and rebuild it. Will order new clips for the p/s driveshaft too, it's definitely missing and I'd say was my entire problem. Kind of wish I'd worked it out before I pulled both boxes out but if it's rebuilt I should hopefully not have too many problems with it, might even take 5th out of the Cino box and chuck it in the GTi box while I've got it out. The gti uses different ratios but not sure on final drive. Have a good look. Annnnnd Driveshaft is U/S and took box with it. Driveshaft has scalloped the bearing/race? outside the spline where it came out. Suspect it would cost more than the car did to get a new genuine one. So much for my nice cheap daily. Driveshafts not too bad to find but a genuine GTi box that's not fucked... News at 11. Depending on whats damaged you might be able to source parts from other members on here. Cino boxes if i remember right use the same gears for 1st and 2nd but 3rd and 4th are different and i would expect 5th to be the same. I did a rebuild a while back and need to refresh my memory. I think the cino splines are supposed to be smaller as well. Some old posts probably mention most of the info. 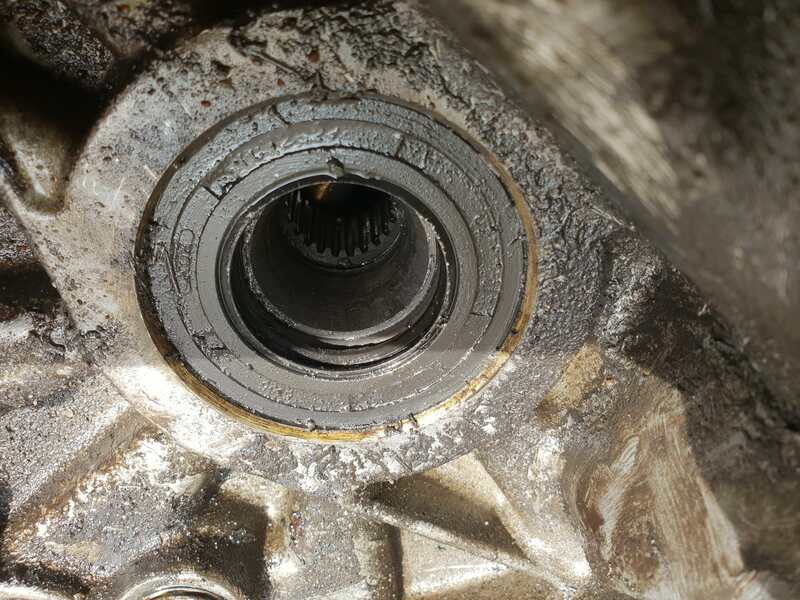 From my knowledge on driveshafts they cant just fall out and that little circular clip is not the thing holding the entire thing in - it's the drive axle nut that locks and secures everything into place. Possibly the previous owner fitted the wrong sized d/s to your car which has caused it to work loose? A very strange one indeed! Photos of the damage might help. Would a inner uni/cv whatever it’s called fail make the shaft come out? Like no or failing circlip allow it to drift out with cornering and the extra work it’s trying to do? Thow some pics on here, we love to see damaged stuff almost as much as new parts! Back at work for a the next week, will take some pictures when I get home. It's not super impressive anyway. Here's the post I meant to put up two days ago and apparently didn't push post. Yeah I've got a Cino here and thought I might be able to patch it together for the week with a second hand drive shaft and box out of it. Hub spline is smaller so that's a no go. As for rebuilding the box it's the bearing? 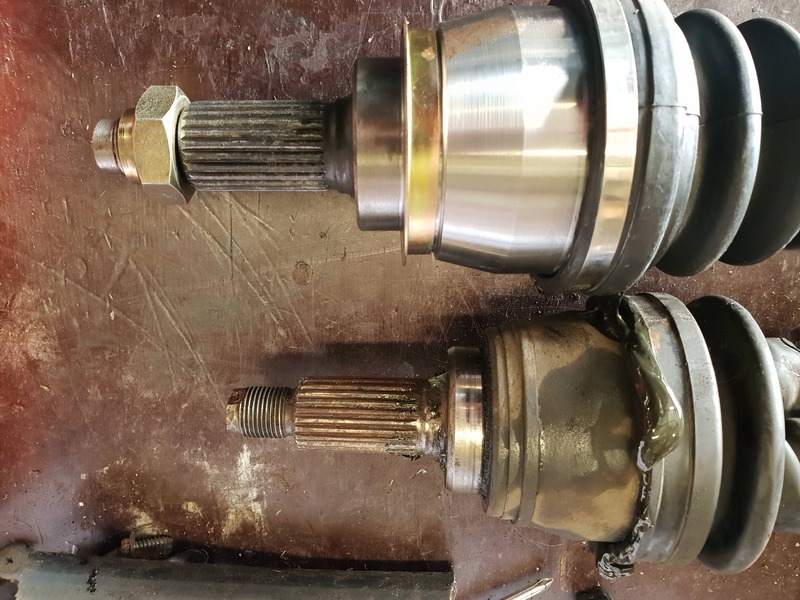 where the drive shaft goes into the diff that's mangled, the spline looks fine inside the box but where the shaft bears on the outside of the spline has scalloped out enough that my mechanic says I'll never keep a drive shaft in it and it'd probably be stupidly expensive to replace. I suppose if they're the same between boxes I could swap bits out of the Cino box into the GTi box but finding out just what bits are what is hard with a lot of the resources on the net having gone missing over the years. As for the shaft falling out, falling out is a slight exaggeration. It came out enough for the spline to not engage but not enough to actually drop. Will have to check and see if the Cino shaft is shorter than the GTi one when my new one shows up. I think what you want is one of these. This came out if a spares box and looks ok, a bit of surface rust from living under the house. I think i read a old post where a cino small inner was put on a gti shaft creating a frankenshaft. But would that mean the passenger side has frankenshaft and drivers side has cino intermediate shaft and you use your cino box? People on here have used the cino box, easier than getting gti box. I could part with the diff hemisphere if your outter shaft area is ok, thats just for the seal. Sorting through my old stuff. Yep that's the bit I want to rebuild the GTi box. I'll pm you. Anyway, have taken some pictures, linked as URL's because the pictures are huge and I cbf cropping them, also you can see the detail better. This is the input? on the diff that you can see is marked up and not in a good way. And this is why it happened in the first place. You can see the new shaft and the old one. The box end of both of them is parallel. Bloody thing was a solid 60mm short. It must have been ,driving on the teeth on the end for a while which is why they look like they do I suspect. Some idiots taken a cino hatch short shaft and stuck a GTi CV on the end. Have got it back together with a Cino box in, replaced the missing gearbox bolts and flywheel cover while I was at it. It lives and seems to run fine although with the 16s on it the cino box feels bloody slow compared to what the GTi box did, fuel economy in fifth though will be better, looks to be nearly 900 rpm difference at 100 which should be good on the way to work. Am thinking that I might use the rubber up on the 16s then just buy some nice looking 14s anyway. That way I can replace the inner guards that someone took off. Calibrated the TPS while I was at it. Followed the instructions in the tech section and while it made my run on throttle better it's still pretty bad, up to a full second of lag after taking the foot off although it seems worse at low revs which is weird. It's slightly ruining my enjoyment so I do want to work out what the hell the problem is and fix it. TPS could even be stuffed for all I know. Tidied up some very dodgy wiring and put a genuine thermo fan in where it had been replaced with an aftermarket one wired in to accessories. Need to get the right size switch for it though as there's not one on the thermostat and for some reason the AC switch is in the thermo switch port and the AC switch port has a brass bung in it. It's making life hard as they appear to be different sizes, the switch out of my cino appears to be an m18 and the port on the GTi looks to be an m16, but the AC switch port looks smaller again m12? maybe? So I need to get a smaller AC switch and thermo switch. There's a g16 sedan at the wreckers down the road that's supposed to have the right thermo switch in it but I doubt anyone locally will have the AC switch I need, may have to see if I have the right thermostat housing or maybe get an m12? -> m16 bush.